Picturama is a digital photo software. It is a picture viewer that allows you to view pictures of many different formats. 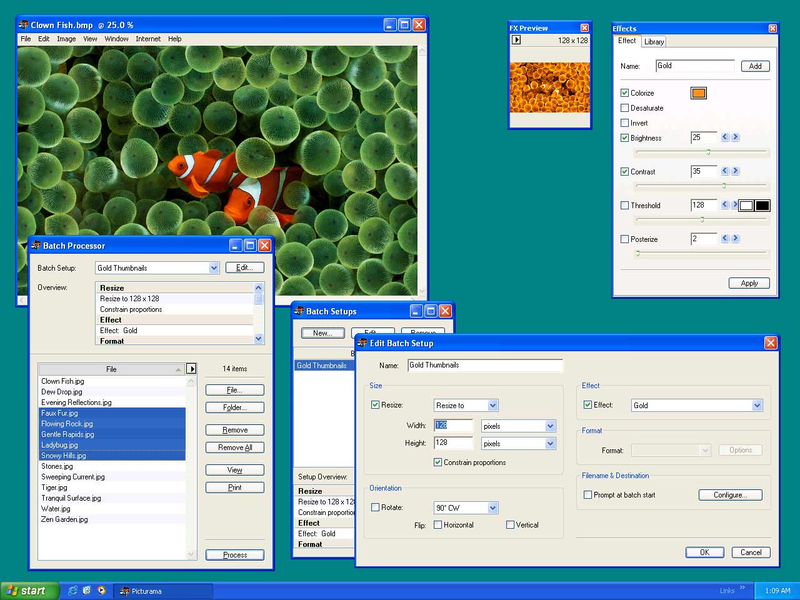 It is an image editor that can resize, scale, rotate, and flip your graphic files. It can adjust your images with various graphic effects such as colorize, desaturate, invert, brightness, contrast, threshold, posterize. You can also combine all mentioned graphic effects into a single effects set which can be applied to a selected picture with a single click. Picturama is also an image converter. You can convert your files to all formats supported by QuickTime which include Photoshop, JPEG, TIFF, PICT, SGI, TARGA, BMP, PNG, etc. It can be used as a thumbnail creator to make stylish thumbnails that fit your web site graphic easily. With the powerful batch processor you can automate all functions of this picture editor and adjust large number of image files quickly, with few easy clicks. Picturama is ideal tool for viewing and adjusting your pictures.